Doctor Who: The Moffat Scripts – THE WEDDING OF RIVER SONG | Warped Factor - Words in the Key of Geek. 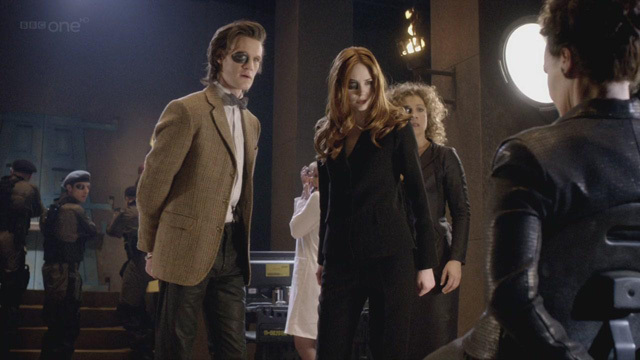 Series six’s finale, The Wedding of River Song, is probably the single most divisive episode that Steven Moffat has ever written. To the mind of some it’s a disjointed mess but to others it’s a brillaint episode that’s filled to bursting point with great moments and one that resolves several lingering plot threads in satisfying style. Whichever way you look at it, you can’t deny that both sides of the argument have valid points. So addressing the complaint that it’s disjointed – fair enough! I can’t really dispute that statement. The story does jump around from place to place at breakneck speed moving from one scene to another. Each of these moments does lead into the next but the tone can be jarring. 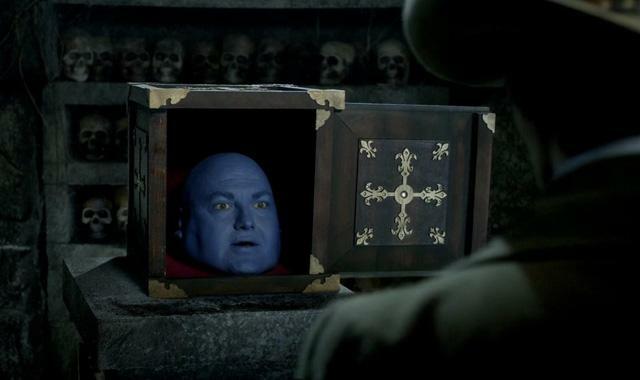 We go from the Doctor’s confrontation with a Dalek to meeting one of the Silence at a bar to a game of electric chess to meeting a head in a box cheerful about the quality of his Wi-Fi connection. At one point we have Pterodactyls flying over London, Dickens promoting his latest book on BBC Breakfast and Romans in chariots waiting at a red traffic signal, all while Holy Roman Emperor Winston Churchill returns to the Buckingham Senate atop his personal mammoth before calling for the Doctor, his soothsayer. It’s all over the place in tone; sometimes it’s funny, sometimes it’s serious, there’s something sad and there’s something scary. So, is it disjointed? Yes. Does that make it bad? Not necessarily. I think it makes it fun and entertaining. Steven Moffat agrees with me, calling it “a big roller coaster ride of Doctor Who madness”, and it’s not hard to see that he’s right about that. But in amongst all the madness there’s one scene that manages to put the craziness aside and bring on the tears: the (off-screen) death of Brigadier Sir Alistair Gordon Lethbridge-Stewart. The Brig is by some way my favourite companion that the Doctor ever had and when the news broke in 2011 that the world had lost Nicholas Courtney it would have been a travesty of justice if Doctor Who failed to acknowledge it. I could talk about how wonderfully written the scene is but I think Moffat’s script speaks for itself. NURSE: Doctor, I'm so sorry. We didn't know how to contact you. I'm afraid Brigadier Lethbridge Stewart passed away a few months ago. Doctor? NURSE: It was very peaceful. He talked a lot about you, if that's any comfort. Always made us pour an extra brandy in case you came round one of these days. DOCTOR: It's time. It's time. Can anyone watch the scene in question and not feel emotionally moved? Can you watch it without crying? Everybody knows that everybody dies and nobody knows that like the Doctor, as River Song once said, and now that it happens to his best friend it’s enough to make him realise that he can’t run from his ‘death’ forever. He cheats out of dying of course, hiding inside the Tesselecta – Moffat leaves this solution in plain sight and actually gave it to us months in advance back in Let’s Kill Hitler. It’s not cheating because nothing has changed. The fixed point is now, and always has been, the destruction of the Tesselecta. It wasn’t changed, just our understanding of it was wrong before. Very cleverly done! This story throws in every possible extreme of what Doctor Who as a show is capable of. Moments like Gantok falling into the pit of skulls, Amy killing Kovarian in cold blood and the attack of the Silent priests inside the pyramid show Doctor Who at its most dark and provide the scares. Moments like the Doctor cheating death, when Amy explains that she can still remember how time should have progressed and the wedding of the title will have you cheering. Dorium’s comments about the Wi-Fi and the game of LIVE chess provide the humour. If you can watch the Doctor’s aforementioned phonecall to the deceased Brigadier without crying then you’ve done the impossible. "It's all still waiting for you... the fields of Trenzalore, the fall of the Eleventh. And the question. The first question, the question that must never be answered, hidden in plain sight. The question you've been running from all your life! Doctor who? Doctor who? Doctor... WHO?!" But before that comes about we will give the Doctor six more adventures with Amy and Rory, even though it feels like their story should have ended here. By the time that this story ends they know, thanks to a visit from River, that the Doctor managed to survive but he doesn’t know that they know. If you ask me that’s how it should end, with them knowing that he’s alive but him off doing his own stuff without them. It feels, to me anyway, that bringing them back again after this was unnecessary. 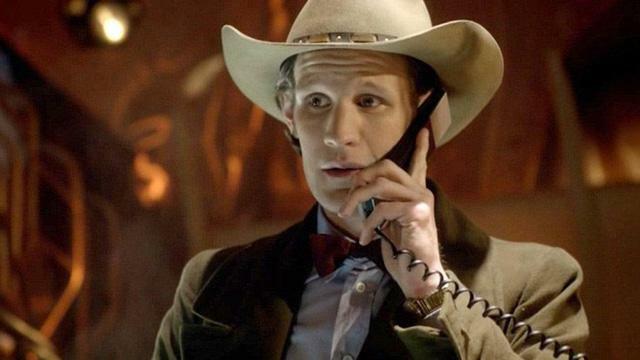 In the Christmas Special that follows the Doctor has some one-off companions and then in series seven he gets a new one – that’s what should’ve happened. But no, Moffat had to bring them back. Don’t get me wrong, I love this particular TARDIS crew, but in all the stories with it that come after this one it feels like we’re just treading water before they move aside for Clara. Having said that, The Angels Take Manhattan is brilliant and we’ll explore my thoughts on how their story actually ended when we get to that in three weeks’ time. 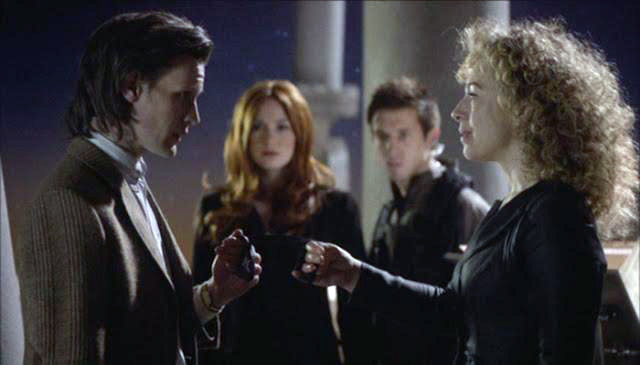 Sticking with The Wedding of River Song though, for an episode that sets out to conclude the first half of Smith’s time it’s a huge success. It’s an underrated story that, with the benefit of hindsight, is worth another watch today, because now we know how the 11th Doctor’s adventures come to an end, this sets the end up superbly.